It is one thing to attract people to courses at a venue and it is another to keep them coming back. That is why the Randwick Sustainability Hub runs recharge events for past-course participants. They are the opportunity to renew acquaintances made at courses and past events, to learn something new and to share the conviviality of good company and good food. Recharge events are a part of what we have come to call ‘social permaculture’. 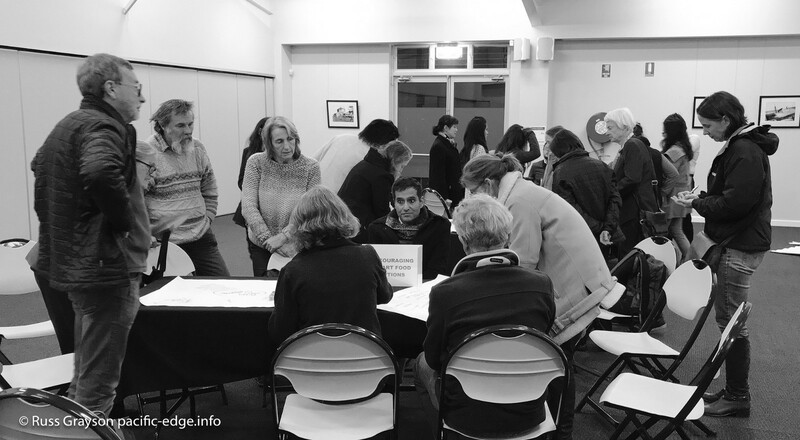 The evening was organised by Randwick Council’s sustainability educator, Fiona Campbell, and MC’d by Annette Loudon from Community Exchange Systems Australia, the organisation providing online infrastructure for Local Exchange and Trading Systems (LETS) which engage in cashless, community-based trading. An online systems and community trading expert, Annette has attended courses at Randwick Sustainability Hub, including the Community Leadership courses which her role at the evening’s session prepared her for. 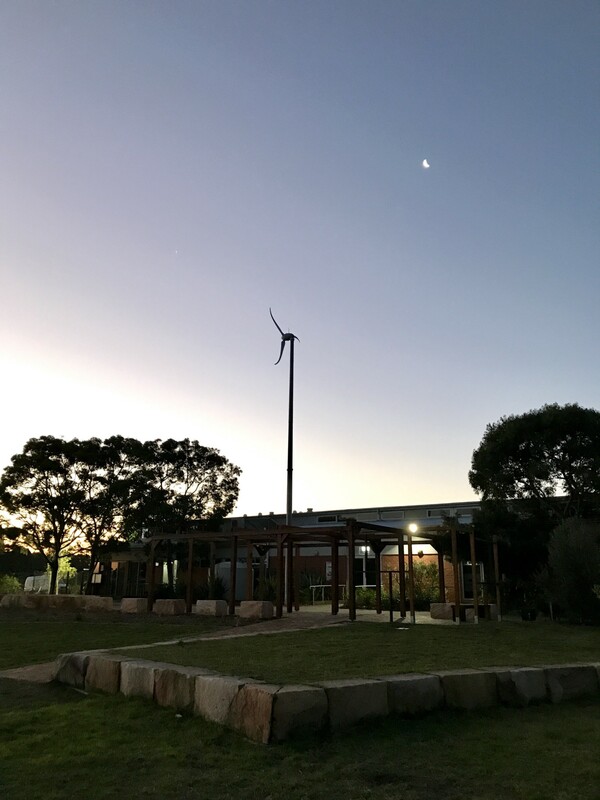 The evening was a function of Randwick Sustainability Hub, the community resilience education overlay to the Randwick Community Centre and its Permaculture Interpretive Garden and landscaping. Following the film, the World Cafe process brought people together in groups to think about how some of the ideas in the film could be localised. The film evening was three things. First, and like past film evenings, it was an implementation of ‘social permaculture’. Social permaculture works with what permaculture co-inventor, Bill Mollison, called the ‘invisible systems’. People, the relationships between them and the systems they set up. Invisible systems contrast with permaculture’s ‘visible systems’, the hardware of permaculture design like buildings, farms, gardens. Second, it was a recharge event for people who have done courses and workshops at the Randwick Sustainability Hub. Recharge events are a chance to catch up with people and renew acquaintances. Doing this reinforces those links so important to local networks. Third was the film itself and the problems and solutions it raises. At recharge events like this people don’t simply watch the film then go home. Films are followed by structured, small group discussion, then supper. These are not ‘talk-at’ but ‘talk-with- events. The film for the evening was Tomorrow and it offered plenty for the group discussions that followed. The product of a group of French video producers, Tomorrow visits Europe, the UK and the USA to look at what people are doing to develop solutions to living in a world beset by a changing climate and what that brings with it, a population soon to be nine billion and other trends degrading societies and environments. The solutions it looks at are in energy, food, waste, economy and democracy. The filmmakers visit a permaculture farm and Incredible Edible Tormorden in the UK. They talk to Transition Towns’ Rob Hopkins in Totnes in the UK, urban agriculture practitioners in Detroit, meet Jeremy Rifkin, look at complementary currencies in the UK, wind turbine co-ops in Denmark, talk with Indian agricultural reformer Vendana Shiva and visit an experiment in local government in India. At two hours, the film is the maximum length for following with a group activity. I think the range of topics and the pace of the film kept people engaged — the film is a whirlwind tour and feels like it, in a positive way. In planning recharge/film events like this Fiona includes a process to relate the film’s topics to local initiatives. This grounds the issues raised in the films to where people live. To do this, she and Annette adopted the World Cafe format. Groups of around six clustered at tables to discuss local responses to and local examples addressing the themes of the film: food, the sharing economy, active transport, waste reduction, water and energy. These local responses people wrote on flip-chart paper which were photographed so as to retain a record. This was a convivial event. Conversation continued over a super of sweet corn fritters, rice paper rolls, dolmades and fruit. It was getting late by the time the last people drifted away into the cold winter night. The Randwick Sustainability Hub prototypes the implementation of permaculture ideas in local government. The community and pre-and-primary schools education programs, courses in organic gardening, forest gardening and Living Smart and the Eco Heroes Club for 5–11 year olds complement the energy-and-water-efficiency retrofit of the community centre building, the Permaculture Interpretive Garden and associated landscaping on-site. Early evening comes to the community centre building where the film was shown. The building was retrofitted for energy and water efficient performance and the Meeting Place seating and pergola, seen here, completed later.